Mall Scavenger Hunt Party Ideas and other fun mall games! 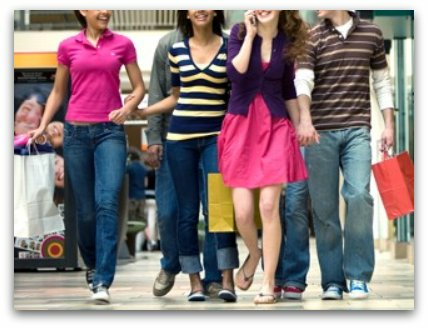 A mall scavenger hunt party is all about having fun with your friends and searching for the fun, silly, and/or unusual. I think the best kind of mall scavenger hunts are the kind where you use your camera to find people or things. In these kinds of mall hunts you don’t have to spend money or carry around strange or weird items, just your camera. Make sure to tell everyone to ask someone before they snap a picture of them, people usually do not mind if you tell them what it’s for. This printable kit makes it easy to throw your mall party. 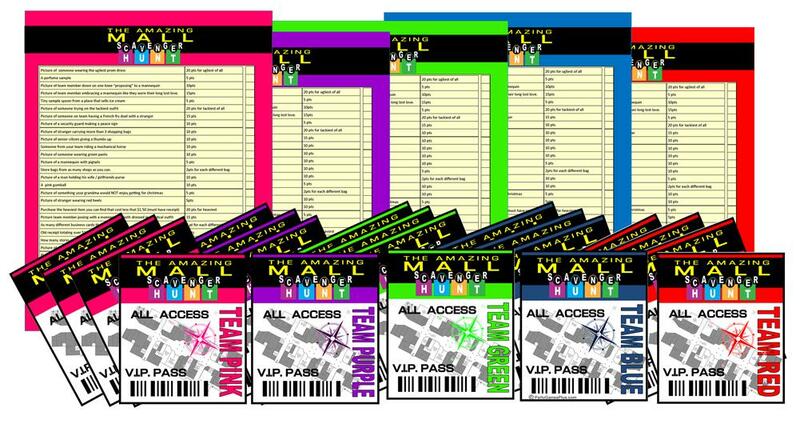 It includes editable invitations, scavenger lists, and team badges! This mall scavenger hunt utilizes the digital cameras. When playing the celebrity look-alike scavenger hunt each team must have at least one camera. The object is to find visitors in the mall that resemble famous celebrities and get them to pose for a picture. Each team has an hour to collect as many celebrity look-alike pics as they can. The judge or judges make the final call on which pics count as look-alikes, though it should be judged loosely. Here is a common judging scale and point value scale for this a look-alike mall scavenger hunt party. 3 points – could mistake them for the celebrity from a distance. Anyone on your team giving someone (not on your team) a hug. A picture of your entire team. Someone getting their ears pierced. Someone going the wrong way on the escalator. A scavenger hunt is an awesome way to celebrate your birthday with your friends at the mall, but adding a unique twist to make the day a fun memory for you all. You can end the party by meeting up at the food court and having funnel cakes and sodas for everyone. Looking for more fun things to do at the mall with your friends check out these fun mall party games or even add your own! Tell us some more fun games to play at a mall party? Do you have a fun idea for a mall party game? Share it! Your idea will appear on a Web page exactly the way you enter it here. You can wrap a word in square brackets to make it appear bold. For example [my mall game] would show as my mall game on the Web page containing your idea.